All the fun of darts, but with powerful magnets enclosed safely inside! The darts stay in place, won't harm walls, or hurt children. This game is great for all ages and skill levels. Learn the game of darts! You can play alone, or play with friends or family that's safe for the home and kids. You can improve coordination and encourage sportsmanship, while enjoying family game night. Doink-It Darts has the same characteristics of the classic, right down to the faux cracks on the board, size, style, and targets. 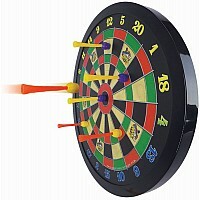 The dart board comes with a hook to easily hang in any room. Strong, balanced neodymium magnets and our light, virtually indistructible space-age Doink-It material always keep darts flying accurately for optimal dart performance. Doink-It Darts Magnetic Dart Board is the finest, best-designed dart set made. Measures approximately: 16.20 x 15.80 x 1.50 inches..